JohnMerica is a passionate hip-hop gospel artiste. 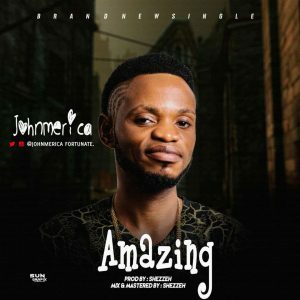 He is out with an irresistible hit track to lift the spirit of everyone titled Amazing. His amazing hit song with the hit words(Gban Gban Gban ) will command your spirit and body to dance and rejoice. JohnMerica hails from Oboll-Afor, Enugu State, Nigeria. He’s not just out to drop a hit, make some money and disappear. He has come with undying passion to fulfill his calling. Behold your new Superman superstar JohnMerica. Think is really amazing, very hard to stop listening to until the end. Think man needs to be encouraged through different means. This track has loaded my spirit with joy. I think it’s a potential hit song. The beat and the singing part are great. While D song was playing, my kids joined singing: gban gban gban. Really interesting. Listen to johnmerica for more hit track!!! The guy is really talented..
d wold God is amazing,,,, always inspires me and d music is emotional and adorable a lot…. is a music that i always which to hear….. am shepetor frank by name…..
it is an inspiration Gospel music….. lot of love for d singer…..
amazing is emotional great I think a lot of good things when am hearing d music,,, it shows we are never Alone….. I downloaded this song from Naijaflaver and my brother was like he knows the singer. I thought it was a joke till he showed me his pics.. I must confess this song is extraordinary. I came across this song while browsing for latest posts and I must confess itz a very nice and inspirational song..
And he is also handsome..
Mhen this jam is wooow!! This is really wonderful, may God keep on giving you inspiration.